Effective as a single specimen, in grouping, in the shrub border, especially nice in woodland and naturalized type situations. It has a weeping form, contorted stem with shoots arching to produce an umbrella-shaped crown. Spring time brings you attractive purple flowers giving way to large heart shaped purple leaves. Stunning golden, threadlike branches are the trademark of this evergreen shrub. The cascading nature of the branches also adds an air of elegance to any mixed border. Easy to grow and adapts to most locations. We offer the Gold Mop 18" in a 5 gallon container. Considered the best and most attractive native flowering tree, the Cherokee Princess Flowering Dogwood is the top choice. At an early age it is covered with large, pure white blooms that are long lasting. During fall, the foliage turns fiery shades of red and crimson. We offer Cherokee Princess 6' tall in a 15 gallon container. The kousa dogwood, well know for it toughness, makes it an excellent choice for home landscapes. In the spring, it produces an array of star-like blooms. In the fall, it offers bright red foliage. The pink dogwood is a very popular landscape tree. Pretty pink flowers start lighter in color, and then get slightly deeper as the tree ages. During the fall the leaves turn a fiery reddish-purple. The fruit of the Pink Dogwood is an important source of winter food for many songbirds. We offer Pink Flowering Dogwood 6' tall in a 15 gallon container. The expanded floral bracts are white with a tinge of green, and form a small cup early in the season. However, the bracts flatten and become pure white in a few days. The leaves are dark green during the summer, heat resistant and turn reddish purple in the fall. 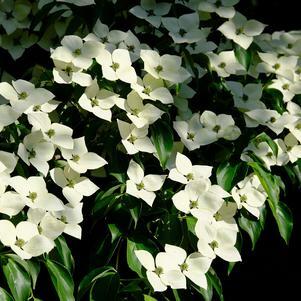 We offer the Celestial Rutdan Dogwood in a 15 gallon container. One of the most popular evergreens for quick growing screens available. Dense bluish-green, wispy foliage on upright slender branches contributes to its gracefulness. The leyland keeps its naturally pyramidal shape as it matures. Makes an excellent windbreak, screen or single specimen. We offer the leyland cypress (single leader) 30" to 36" in a 5 gallon container and a 4' to 5' in a 10 gallon container. We also offer the leyland cypress (single leader) 5' to 6' in a 15 gallon container.